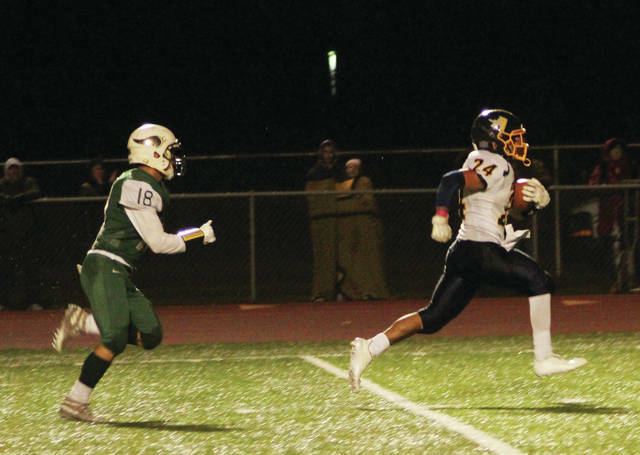 Archbold’s Noah Gomez races to the end zone for a second half touchdown last Friday in a win at Evergreen. The Bluestreaks are just out of the playoffs prior to week 10, coming in at ninth in the rankings for Division V, Region 18. Archbold will need to move up one spot in order to make the playoffs, as they currently sit at ninth in the latest Ohio High School Athletic Association football computer rankings that were announced Tuesday. The Bluestreaks were also ninth last week in the rankings for Division V, Region 18. The top eight teams from each region make the playoffs. Archbold (6-3) closes the regular season on the road at Swanton (3-6) Friday night. No other Fulton County teams were ranked in the top 12. Region 18 – 1. Liberty Center (9-0) 21.1768, 2. Genoa Area (9-0) 20.0056, 3. Oak Harbor (8-1) 16.8889, 4. Anna (7-2) 16.5167, 5. Elyria Cath. (7-2) 15.7222, 6. Marion Pleasant (7-2) 15.6722, 7. Casstown Miami East (7-2) 13.8556, 8. Richwood North Union (6-3) 12.702, 9. Archbold (6-3) 12.4333, 10. Lake (6-3) 11.5278, 11. Eastwood (6-3) 10.6167, 12. Ottawa-Glandorf (4-5) 9.9222.